Iain Davidson says Raith Rovers won’t park the bus in their Scottish Cup tie with Hibs on Saturday. The Stark’s Park side travel to Edinburgh to face the Premiership side in the fifth round clash and defender Davidson says Rovers hope to get a result for the travelling support. Nine supporters buses organised and subsidised by the club will leave Pratt Street on Saturday alone and Davo says that the fans can play their part. “We got a massive lift from fans in the Dunfermline game,” he said, “it was a derby in the Scottish Cup so tickets for the stadium sold well. “As a player that’s what you want so hopefully there’s going to be a big crowd. “Hibs are a big club and we’ve done well as a team to get here and the fans seem to be getting behind us for Saturday’s game. 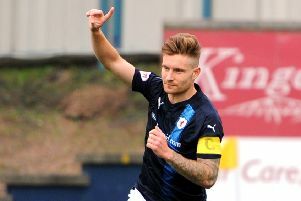 The tie gives Rovers a welcome break from league duty and Davidson admits that results in recent weeks, including Saturday’s draw with Forfar, haven’t been good enough. “It’s so frustrating and annoying more than anything,” he said, “there’s no way we should have drawn the game on Saturday. It felt like a loss. “With respect to Forfar, we had six or seven chances, they’ve had one chance in the first half, one shot in the second and they’ve scored and get something out of the game. “We watched the game on Monday and I came away thinking how frustrating it was. You’re thinking, how are we not winning games? “I don’t think we’ve been getting the rewards from the league to be honest. We seem to be getting punished, but it is what it is. “We defend and score as a team. It’s not just defenders, then attackers trying to score the goals. We’ve got to chip in as well. “That’s what the gaffer is trying to get across collectively. If the second or third balls are bouncing about in the box, you’ve got a duty. It’s up to everybody. “It is frustrating because we are playing really well. I’ve also seen a big improvement in the gaffer since he came back from Celtic. He’s learned an awful lot under Brendan Rogers, you can see that. Now Davidson and his team mates will turn their attention to Hibs, who are currently in a state of transition following the departure of Neil Lennon and are undergoing a poor run of form. Davidson said: “They’re going through a wee bit of turmoil at the moment. Can we take advantage of that? Time will tell. “I hear that they played well against Aberdeen on Saturday but didn’t get the result. “Maybe the pressure will be on them for a change instead of it being on us in the league. “The gaffer’s worked on Hibs so far and we’ll do it again on Thursday and Friday. But we won’t take their situation for granted. “We looked at Hibs and we looked at our league game from the weekend there. “This will be a good break from that. It’s a big trophy to try and do well in so it’s something to look forward to. “Obviously under John McGlynn we got to the semi-final before when we played Dundee United at Hampden [in 2010]. “I know what it feels like so it’s a good incentive to try and push on. “First and foremost though, we concentrate on ourselves. We’ll set up well. Be well drilled by the gaffer, well prepared and give it a good go. “With the greatest respect to Hibs, it’s a game that’s winnable. “We’re looking forward to it and hopefully we can get a positive result.